Why aren’t teachers playing the game? Whilst sorting through recycling may not be at the top of most people’s bucket-list, an entry into a competition organised by The Fun Theory (www.thefuntheory.com) has certainly found a way of making it more engaging. By modifying a bottle bank to incorporate a few flashing lights and developing a scoring system that rewards users who deposit coloured bottles in a particular order, more than 50 times more glass was collected. This remarkable achievement is down to an increasingly common form of engagement through what is known as ‘gamification’ – a process where game design principles are applied to non-game situations. The rise of what could be described as ‘serious games’ are not only providing our kids with entertaining ways to master skills such as calculations, spelling or typing, but they’re now able to immerse a learner into the heart of a context. 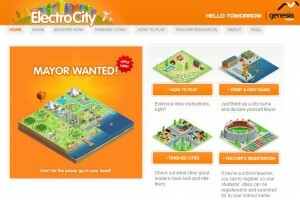 Electrocity (www.electrocity.co.nz) challenges learners to build their own energy conscious city. 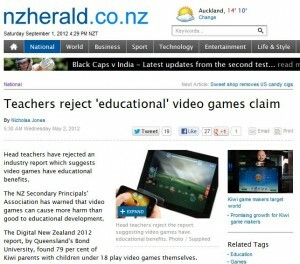 The New Zealand Secondary Principals’ Association publicly rejected the gaming industry’s recent claim that video-games have educational benefits (The New Zealand Herald, ‘Teachers reject’educational’ video-games’, 2 May, 2012). Whilst it seems that such claims are obviously self-serving, surely it would also be misguided to suggest that playing video-games will not lead to educational benefits? Surely a video game is merely a form of media just like a film or a book. It would seem absurd to say that films lack the potential to support learning, even though many of them may have a negative effect. Surely it’s time for the discussion around video gaming to move towards a critical evaluation of which types of games are most likely to have a positive effect on learning. Without judging each game on its own merit, don’t we risk throwing out the baby with the bath water? Perhaps this one-sided approach is preventing these highly engaging resources from becoming more ubiquitous in our schools. When investigating the principles of game design, it’s remarkable how similar they are to the principles of lesson planning. In addition to an engaging context, the game needs a clear objective and must allow different players to progress at their own pace. During the game, the player needs to receive regular feedback to help them improve and encourage them to persevere. An opportunity to fail is also built into games by giving the player a number of chances (or lives) to make a mistake and an infinite number of chances to reset the game and have another go. Aren’t these the same features that would be present in any good lesson? Perhaps game designers just use what we recognise as effective pedagogies as their design brief? It might be naive to suggest that video games are going to revolutionise the way we engage learners, but surely this form of resource could be another string to our bow. So, let’s not say ‘game over’ before we’ve even pressed start. Why not pick up the controller and search for the bonus that these resources could offer? Maybe we’ll soon find ourselves progressing to the next level.